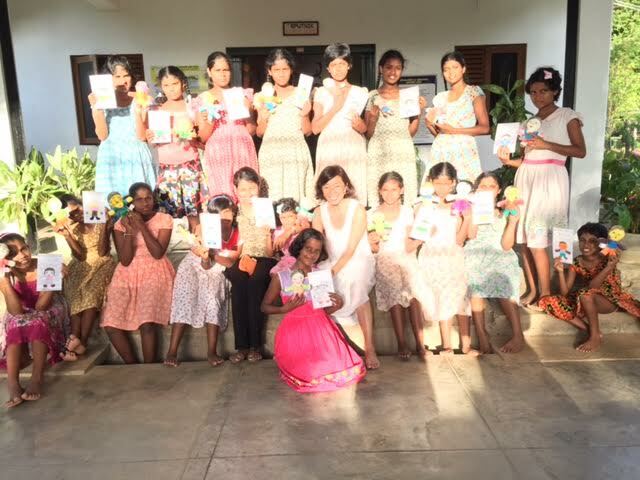 Last week 20 dolls traveled from the States to Sri Lanka, and we met 20 wonderful girls at Sputnik Girls Home in Kurunegala. This home was founded in 2007 and there are 20 economically and socially disadvantaged girls age between 5-18 are living together. When we walked in, the Founder and Chief Director Mr. Eshantha Ariyadasa welcomed us with a great smile, and the girls came to greet us. We spent some time talking and getting to know each other, and the girls started decorating the dolls. Each one of them were so amazingly creative, and their personal messages were so powerful. After they finished decorating, each girl received one doll from the States we brought. The girls were proudly showing their dolls before they said goodbye to them. Some of the dolls were from Eugene, Oregon which were made this summer by 20 girls at Ophelia's Place. This doll was made by our special friend Betty who is over 90 years old lives in New York, and we presented to Eshantha. Let us share a nice story from Sarah McDowell who is a college student took an initiative to travel from New Jersey to Oregon this summer. ”This summer I packed my bags and boarded the plane for somewhere new. New faces, new experiences and new ideas. I was by myself when I arrived in Eugene, Oregon with a box of stuffing and fabric markers but I left with new memories and 20 new DOLLS. While explaining the idea, many of the younger girls at Ophelia's Place, a community for the　empowerment of girls, were confused, but I was able to explain that we were making presents for other girls who don't have their own dolls. Their faces lit up, and they asked if they could add notes to the dolls. One girl was exceedingly proud that she made not one, not two, but five dolls. Many of the girls at Ophelia's place are not only there for fun, but are also foster children or have been in unsettling situations. They are there for themselves, which only made it more amazing when they were helping other girls. I have to admit one girl, who was only seven, was a much better stuffer than me. And a few girls were only too happy to see in the labels. I was amazed that they were just as excited to make these dolls as I was. Now seeing a photo of a little girl with her new doll and the photo of Maggie, who made the doll, I am so happy that I was able to connect a little girl in Eugene, Oregon to another little girl in Sri Lanka." Before we said goodbye, we promised them that we would give their dolls to someone very special. The dolls will continue traveling the world until they find final homes! After the dolls left Sri Lanka, they visited in India for a couple of days on the way coming back to the States. Newer PostBig event is coming up!!!! We are so excited. Older PostAll the way from Turkey!!! !